This fall break, my brother and his girlfriend wanted to go to London for the weekend. That’s not easy with two small children, so I agreed to stay in Belgium with my god-daughter. The baby went to London too as she still needed to be breastfed ;). Staying indoors with a two-year-old for a whole weekend wasn’t recommended by my brother and he proposed that I’d look for an activity. 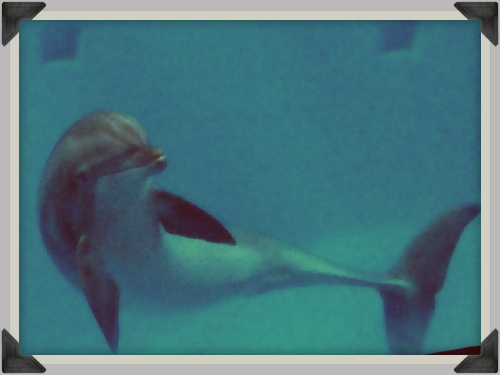 After some contemplation and research I decided to take Janne to the Dolphinarium. And what a splendid decision that was! Even today Janne still mentions dolphins at least once when I see her. This talk is often accompanied by her lying down on the floor with both legs in the air to demonstrate how dolphins move their tails. So cute! 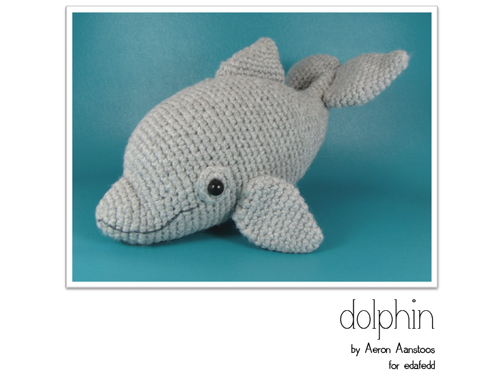 So when it was time to decide on my Christmas gifts, a dolphin couldn’t be missing. It had already been a while since I made an amigurumi, so I wasn’t really enthusiastic about it, but when I saw this pattern on Ravelry, my fingers immediately started to itch. I chose Veritas Nevada for the yarn, an acrylic yarn I had bought a long time ago to make a rabbit, in lila. When this present was being unwrapped, my god-daughter initially reacted very frightful of the thing that appeared from the wrapper. This gave me a fright as well! But once she realized what it was, she cuddled it very tightly. Phew! And today, the dolphin still receives his daily cuddle. I would say this turned out to be a succes!